1 How to send the user to the black list using the messages? 2 How to add guests to the "black list"? 3 How to view the blacklist? Often, in the "Classmates" faced with highly persuasive people, ready to pour out on you all negative, sending you a message, or commenting on your actions, posts, the pictures on the website. agree, what sometimes it brings a lot of inconvenience and easier to get rid of this "friend". But how to add in the “black list”? It can be done, add this user to the "black list". How to send the user to the black list using the messages? Go to the site under your login and password. Open the message menu. And from the list, that appears on the left choose the dialogue with the user you want us, which must leave your web space. The top line of dialogue with someone is his name, hover over it, The tab "lock" and "Delete all correspondence"
You can simply delete the conversation, and if you are interested in blocking this user, then choose the "lock" in the dialog box will have to agree with it or refuse, if not confident in your decision. 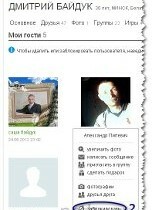 In this way, add the "black list" can not only those, who are enrolled in your friends, but the usual interlocutor. How to add guests to the "black list"? Click the tab "guests" on the top bar of your Profile. Click on it. The screen page will appear, which will affect all visitors to your page, you have had a visit recently. We direct the cursor on your profile photo, you want to block, a pop-up window. From the list of actions, that you will be offered, select the "Lock" function, and agree with the question of, if you really want to Block this user. Now, a guest in the "black list", the same can be done with other unwanted pages visitors. How to view the blacklist? How to add a "black list" of users, we have learned, as well as his view? Drop down to the bottom of the page and, among other menu options, select the "black list"
The screen displays the profiles of those users, that you ever, added to the "black list". by the way, if you wish - of the people from the "black list" can be displayed, just before this beware!